The Pearl River Mountain Collection offers a variety of compelling patterns and styles both simple and intricate. 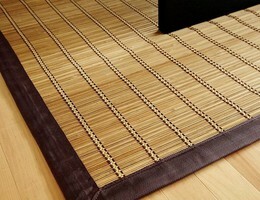 100% Anji Mountain bamboo, the strongest and hardest bamboo in the world with poly border, which cleans easier than cotton. Eco-friendly bamboo from sustainable forests. 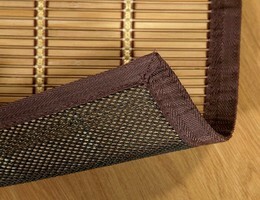 Patented non-slip, ventilated rug pad backing cushions, keeps mat in place and extends the life of the rug. 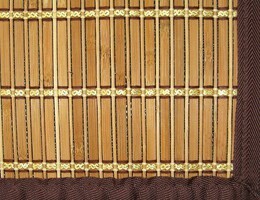 Bamboo is carbonized & kiln-dried to help prevent cracking and warping. Cleans easily with damp cloth or mop. 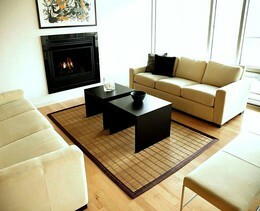 Synthetic area rugs and carpets commonly off-gas toxic, harmful voc?s (volatile organic compounds) into the air. these voc?s can be emitted from both the synthetic fibers that make up the rug pile and the synthetic glues used in the backing. Voc?s can cause a multitude of unpleasant symptoms including eye, nose and throat irritation, headaches, nausea and dizziness. Choosing a natural fiber area rug which does not off-gas is a positive choice that helps create a healthier environment in your home.